Abi W. asks: Why don’t birds fall off branches when they sleep? Everyone needs sleep, but for many birds, by necessity this has to happen while perched on a branch or other place that must be gripped. Anyone who has ever fallen asleep reading and found her book on the floor knows how difficult it can be to hold onto something while snoozing. So how do perching birds do it? Powered by tendons, the feet of grasping birds (think perching birds and raptors) have a pair of them in the back, flexor digitorum longus and flexor halluciss longus, which are connected to deep flexor muscles in the leg. The digitorum branches and works the three toes in the front, while the hallucis works the back toe, known as the hallux. Both stretch over the ankle, and when the bird lands and the ankle bends, this forces both tendons to automatically pull, thus clenching the toes closed. As long as the ankle is bent, the tendons and toes are locked into place. 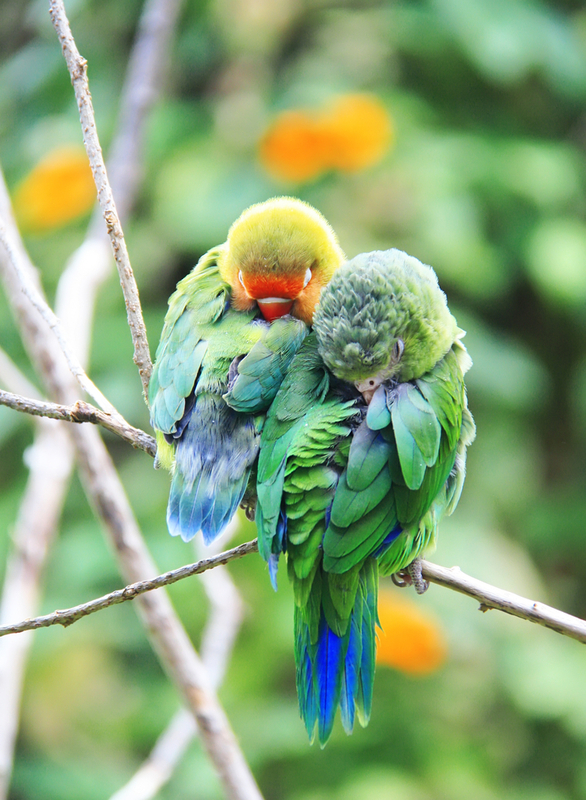 For perching birds, this results in a dependable grip that lasts even when sleeping. Raptors use this automatic response for another purpose as well – grasping prey. As the raptor approaches its victim, its legs are outstretched, but when it lands, its ankles bend, pulling the tendons and closing the toes – resulting in a firm grip on its dinner. Even in flight, as long as the bird’s legs are bent, the tendons and toes remain locked on the prey. Not all birds have this feature, and for those forced to sleep on the ground, some have developed another adaptation to slumber safely – sleeping with one eye open. Known as unihemispheric slow-wave sleep, some birds, like mallard ducks, can keep half of their brain (and its corresponding eye) alert while allowing the other half to take a break. With the mallards, they often rest in a row, with the ducks on the ends closing the eye next to their neighbors, but keeping the eye facing potential danger open. Scientists have determined that these same birds can control this function, and during times of relative safety, are also able to rest their entire brains. Like the mallard ducks, dolphins and whales often sleep with one eye open in order to avoid being eaten by sharks. The ability to stay partially conscious also allows them to continue to get air while sleeping. How dolphins handle this is to put one half of their brain to sleep, while the other half is still conscious and functioning. They then alternate which side is sleeping periodically. They stay in this state for approximately eight hours a day. Doing this allows them to be conscious enough to control their breathing and periodically swim to the surface and get air, while still giving their brain the rest it needs. Sharks need water constantly flowing over their gills. Some have nostril-like openings near their eyes, called spiracles, that push water across their gills when they are still. White sharks lack these spiracles, but studies that track sharks have found that they can sit still for relatively long periods of time. One theory as to why they can do this and live is that great white sharks sleep facing a current, so the natural movement of the water continues to deliver oxygen to Jaws’ body. Sea otters “hold hands” while sleeping so they don’t drift apart. It’s harder for people to sleep at altitudes above 13,000 feet, due, apparently, to the lack of oxygen and its effect on breathing. Sleep deprivation can have similar effects on performance as drinking alcohol – remaining awake for 16 hours is the same as having had a few drinks. People who don’t get enough sleep are often hungrier, it is thought partially because they have lower levels of leptin. Newborn babies need up to 18 hours of sleep per day. Their parents lose between 400 and 750 hours of sleep in their child’s first year of life. In a recent study of mice, it was found that brain cells shrink during sleep – allowing more space between cells for cerebral spinal fluid to flow. The researchers theorize that the greater access this fluid has during sleep allows it to better clear the brain of its wastes. Fatal familial insomnia (FFI), as the name suggests, is an inherited disease whose primary symptom appears in adulthood. Absolutely unable to sleep, its sufferers eventually die after several months. Research has shown that the disease is related to prions, mutated proteins, destroying the nerve cells in the brain. Before color television, it’s thought that only about 15 % of people dreamed in color. Today, approximately 75% do. How do white sharks sleep? Why don’t birds fall off their perches when sleeping? Do they know why this is the case? I would seem more logical to think just the colors of nature would have this effect. I mean, the world was colorful before color TV made it look that way, wasn’t it? Strange. Actually that’s incorrect. Before colour TV, the entire universe was in black and white. The idea that colour existed before then is an urban myth. The assertion that birds have three toes in front and one in the back is not universally accurate. Hookbills (the parrot family) are zygotactal, meaning they have two in front and two in the back. This foot configuration lets them climb in trees better and even hang upside down. Stronger grip.